Your History in the Register ? Welcome to my CDF/Cal Fire Registry History Page. My name is Rich Regan , and this is a short Historical perspective of my time with the organization. My Training, Assignments, Calls, Incidents and Adventures that I recall as vivid memories. My co-workers and friends often called me . My First Assignment with CDF began in : 1979. 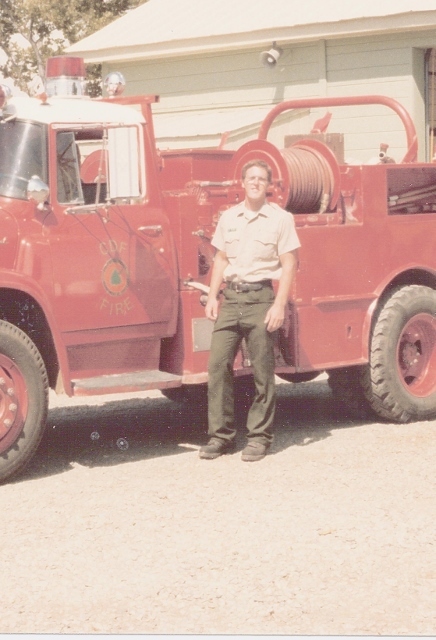 I started as a seasonal firefighter in the Tuolumne-Calaveras Ranger Unit in 1979 at the Arnold FFS. Art Hastings was the Ranger I, Don Hewlett and Don Haldeman were the captains. The crew was Richard Roper, Hayden Riedel, Julie Honer, Bob Mergel, Cathy ___, and a few others whose names have slipped my memory. Engine 4474 was a Chevy model 1. That engine could darn near go anywhere that the model 5 four wheel drive engines could go. I did a few more seasons in TCU at Groveland, Green Springs, and Columbia Helitack , and one season in Santa Clara at the Pacheco FFS. I worked about 9 years in the Fresno-Kings Ranger Unit as an FAE at the Westside Fire District, Mid-Valley stations 8, 9, and 11, and Blasingame FFS and Hurley FFS. I did about 4 seasons as an L.T. captain: Fresno-Kings (Coalinga FFS) , Riverside (San Jacinto FFS), and San-Benito Monterey (Antelope FFS). In 1989 I took a leave of absence from CDF to work for the USFS as a firefighter on the Sierra Hotshots. They say time flies by when you are old but I disagree. My summers as a seasonal FF went by way to fast. I am proud to say that my daughter just completed her first fire season at the Elk Camp FFS in Humboldt-Del Norte.